The Coffin Torture was feared throughout the Middle Ages. It is enough for one to look at the picture to the left to realize the reason. The victim was placed inside the "coffin". 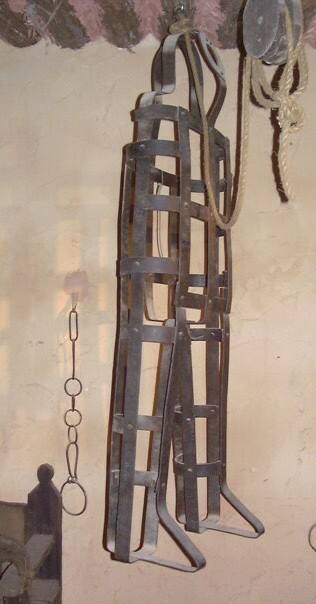 Torturers were well-known for forcing overweight victims into the device, or even making the "coffin" slightly larger than normal to make the victims more uncomfortable. The period of time a victim was to be kept inside the coffin was determined by his or her crime. Very serious crimes, such as blasphemy, were punished by death inside the coffin where the victim was to be kept inside under the sun with animals eating his or her flesh. The coffin was sometimes placed in a public plaza so the local population would congregate around it and mock the unlucky victim. Sometimes death occurred because of the hatred towards the person as others often threw rocks and other objects to further increase the pain.